Beefeater London dry gin has long been a go-to gin in my collection. Now Desmond Payne, the Master Distiller, is bringing us a premium take on the standard recipe, Beefeater 24. I had already heard great things when I received not one, but two full bottles for review in preparation for this week’s Beefeater 24 sponsored Thursday Drink Night. The 24 references the 24 hours that Beefeater steeps its botanicals in neutral grain spirits (24 hours) before distillation. Payne was supposedly inspired by the fact that Beefeater founder James Burrough was the grandson of a tea merchant. In addition to Japanese sencha and Chinese green tea, Beefeater 24 is flavored with Seville orange peels, grapefruit peel, lemon peel, coriander seed, licorice, angelica root, angelica seed, almond, orris root, and of course, juniper. After steeping, the gin is distilled in copper pot stills, and finally finished at 90 proof (45% ABV). The resulting gin provides far stronger citrus on the nose and the tongue than regular Beefeater. The influence of the tea is, to my taste, fairly subtle but provides a nice acrid roundness. Despite the higher proof, I find this to be a slightly sweeter gin than than the regular Beefeater. Perhaps that’s because the peppery notes are far less dominant, and the higher proof creates a richer mouthfeel. Overall, I’m really impressed with this gin. The suggested retail price is in the $28 range. At that price, I think it’s an excellent choice in the premium gin range, and I expect to keep it in rotation in my home bar. Stir until well chilled, strain into cocktail glass, garnish with lemon twist. Beefeater 24 and Lillet blanc work exceptionally well together. I haven’t been using as much Lillet lately, and this drink has given me a whole new appreciation for it. Glancing through the Beefeater 24 recipes, another caught my eye, the Shifting Sands. Credited to Sasha Petraske, this take on Milk & Honey’s Sands cocktail pairs 24 with maraschino liqueur, lemon juice, and grapefruit juice. I didn’t have a fresh grapefruit on hand, but I did have a bottle of Fizzy Lizzy Lonestar grapefruit soda, which tastes remarkably fresh, so I modified the recipe. Shake first three ingredients, strain into ice-filled collins glass. 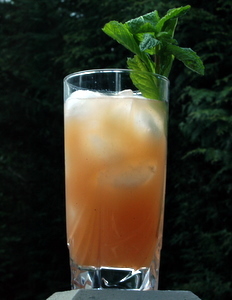 Top with grapefruit soda. Garnish with spring of mint. This is a great summer refresher. I never realized maraschino and grapefruit would pair quite so well as flavors. I’ll definitely return to this combination in the future. Honestly, this may not be the best way to experience all that Beefeater 24 has to offer. It does mix well with the citrus flavors, as I had expected from the gin’s flavor profile. I’m happy to help welcome this new gin to the market. I’m even more excited at the chance to see what the collective cocktail consciousness comes up with at TDN. I’m really impressed with this gin too! Your version of the shifting sands looks like a good one, the original was my fave from the launch they had in NYC. I havent gotten a chance to play with around with it yet, so looking forward to see what TDN comes up with! Hey, looks like you are based out of the US (ignore my comment if I’m incorrect). Anyway, here in the US the regular Beefeater is actually 94 proof or 47% alcohol, making the 24 a slightly lower proof than the regular version. Either way it sounds good, I’ll have to look for it at my local store! Matt, You’re right, regular Beefeater is 94 proof (47% ABV). Should have double checked my bottles. What I meant was that it’s higher than the “standard” 80 proof, but as I’m clearly comparing the two products in the relevant sentence, I should have edited better.